Following in hot pursuit of their famed Coffee Société and Garage 51, the owners of the same establishment is set on another culinary and coffee journey with their latest offspring of Underground Société (US). 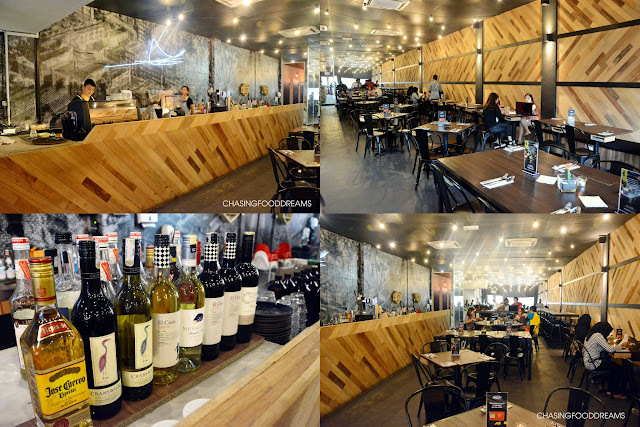 Located in Bandar Sunway, US is quite the talk of the town with its concept of serving great food and respectable coffee with wine thrown in for good measure. Once you walked into the bistro though, you’ll be taken into a modern contemporary space filled with many foodie enthusiasts hanging out for a decent meal with coffee. Designed to vibe a hip and urban industrial ambience, the bistro has wood and steel set with backdrops of unfinished floor, dark ceiling, wood wall panels and a long graphical wall mural. Long banquette seating is available as well as the standard seating in the bistro. I had their mocktail of Virgin Mojito (RM17), a sour and minty beverage that I am very fond of with its refreshing flavours. Kids meal are also available at US so ask for it if you have little ones dining with you. My kid’s meal of Fish & Chips is really good as the golden crispy crumbed fish is yummy while the chips are nice, crisp and golden. If you are into brunch, you would like US’s brunch and lunch menu. The offerings are delightful and creative with lots of prettiness injected on the plating. We had Eggs Atlantic with Avodaise (RM18), US’s version of Eggs Benedict. The platter is so pretty with vibrant colors. Savor thick slices of toasted sourdough bread with smoked salmon, two beautiful poached eggs and avodaise or avocado hollandaise sauce. There was even a strewn of edible colorful flowers on the Benedict to make it prettier. It’s not just a lovely presentation but this dish is delicious. The poached eggs were perfect with the gorgeous soft flow of egg yolk enriching the salmon and toast while the creamy avocado hollandaise is silky, buttery and savory. Another pretty dish of Smoked Salmon Scramble on Sourdough (RM18) was also decent with simple renditions of creamy scrambled egg with salty smoked salmon on sourdough toast. Best eaten hot as the eggs are more soft and creamy and contrasted nicely with the smoked salmon flavours. French Toast with Nutella (RM15) was a whooper! When we saw the dish, we were delighted at the thoughts of French Toast with mint ice cream for brunch. It’s an icy treat and the whole French toast and ice cream was drizzled with Nutella and piled with fresh berries and edible flowers. Now I am not a fan of mint ice cream so I would have preferred this with regular vanilla ice cream but it’s just my preference. It is still a treat as the French toast with Nutella is a match made in heaven. 200g Grilled Atlantic Salmon with Pesto Gnocchi, Sautéed Capsicum and Foyot Sauce (RM36) is also on their brunch and lunch menu. Recently, I have a fondness of fish and have been enjoying lots of fish dishes. This one was pretty good in my books. The salmon was cooked till medium, another plus point for me, the pesto gnocchi was deliciously yum because it was lightly fluffy and the pesto sauce was flavourful. I think it’s quite clever to pair the fish with lots of capsicum as it gives the fish a nice sweet peppery note. The foyot sauce was ok as it is quite similar to a Bernaise sauce. I think the portion is really good and I was happy with the overall flavours and textures of this dish. After we had out brunch and lunch dishes, we moved on to appetizers and main courses for dinner. Platter of Avocados with Jamaican Pineapple Salsa, Stuffed Mashed Egg, Couscous & Caviar and Feta Cheese (RM26) was an appetizer and it was a fairly light one too. Since avocados are good for health, savoring this appetizer with plenty of avocado is a good choice. You get four variations of fillings paired with creamy smooth avocados. Out of the four, I love the Stuffed Mashed Egg and Feta Cheese the most as they have the most flavours in the pairing. Smoked Duck with Pesto, Mozzarella, Parmesan, Arugula on Thin Crust (RM28) was one of my favorite dish that day. I love the smokiness of the deep rich duck flavours paired with nutty pesto and the lightly bitter note of arugula leaves with lots of cheese. All the ingredients go so well and the flavours compliment each another harmoniously. Slipper Lobster Aglio Olio with Asparagus & Chili Flakes (RM34) proved that the most basic pasta can even be a match for the lush slipper lobster. This one is sufficiently satisfying with lovely garlicky and chili notes. Pasta is served only after 4pm. After 6pm, for dinner, check out their Grilled Cajun Chicken Breast with Asparagus, Roasted Pumpkin, Broccoli, Beetroot, Sauteed Herb Potatoes & Robert Sauce (RM33) or Grain Fed Australian Beef Tenderloin with Asparagus, Roasted Pumpkin, Broccoli, Beetroot, Sauteed Herb Potatoes & Robert Sauce (RM49). Both dishes are similar except for the main protein where you choose chicken or beef. The good news is whether you choose beef or chicken, both are really prepared well. The grain fed Australian beef tenderloin is beautifully tender and cooked till medium as requested. The chicken breast was surprisingly delicious as it was cooked to perfection with succulent juices and tenderness from the white meat. There are lots of sidekicks for both dishes and together with Robert sauce, a rich and robust mustard sauce, married everything together beautifully in flavours and textures. Grilled New Zealand Lamb Rack with Mint Crust with Asparagus, Roasted Pumpkin, Broccoli, Beetroot, Sauteed Herb Potatoes & Robert Sauce (RM45) is also another similar dish to the earlier two but this one has nice thick cuts of lamb rack cooked to your liking. I like the mint crust a lot on the lamb as it helps to add more depth of flavours to the lamb. Desserts proved to be hot conversation pieces! 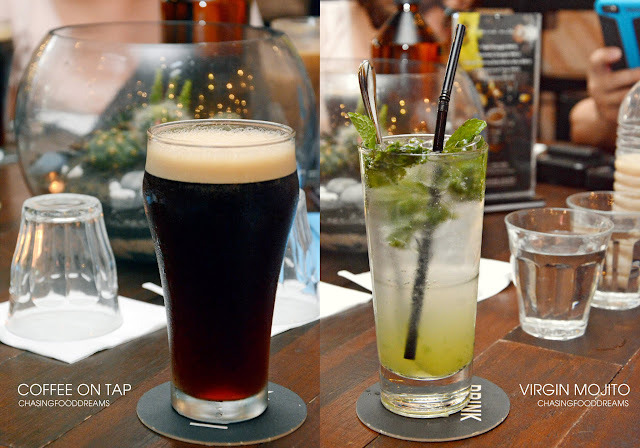 From Underground Grenade (RM26) to Underground Fireball (RM12), both which contains alcohol and is quite the showpiece. Underground Grenade even comes with a tagline of ‘You haven’t been underground till you try this!’. There is a 30 minutes waiting time for this dessert. Beneath the toasted meringue is a mount of mint chocolate chip ice cream with chocolate. Sambucca is poured over and light up to burn off the alcohol. It’s an icy oblivion of minty cream with dark chocolate and fluffy sweet meringue with hits of Sambucca. What more can a girl want in a dessert? Wink! Underground Fireball is also another dessert worth lusting after. Chocolate ball on chocolate sand with a ring of meringue and edible flowers also gets the hot light up treatment with alcohol. Once the fire died out, the chocolate ball melts lightly to unveil more hidden chocolate lusciousness inside the ball. It’s utterly divine and sinful. It may be an underground concept but Underground Société won’t remain anonymous for long. The Choong brothers have certainly added one more potential F&B outlet to their group. At US, it’s not just coffee anymore, it’s also about the food! Business hour 11am till 2pm ?? Night time ? Dinner ?